ECNEC acclaimed ten projects and allocated 218.554 billion rupees in water, irrigation, power, infrastructure and education sector. It also announced to distribute 100000 laptops to the students under the laptop distribution scheme of Prime Minister for youth. ECNEC held a meeting with Finance Minister Ishaq Dar in Islamabad. It was decided in the meeting that 100000 laptops will be purchased at a cost of 4 billion rupees to distribute them among all PhDs, graduates, masters and students doing diploma in Engineering from Polytechnic. 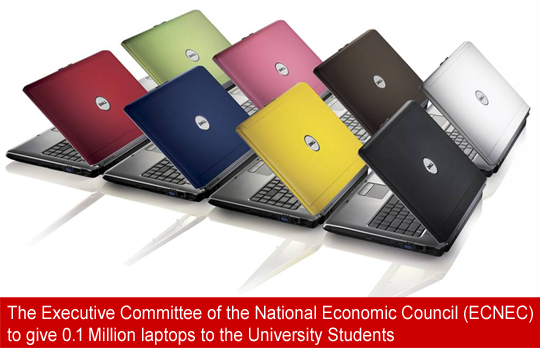 ECNEC also determined to distribute these laptops to the needy and willing students who did not have this facility. The Ministry of Kashmir Affairs and Gilgit Baltistan sponsored a project, “Basic Education for ALL” for educating people of the region of Azad Kashmir by opening schools in that area, this project was accepted by the meeting. They earmarked 1224 million rupees for this project. To accomplish the power needs of Gilgit Town, a project of 14MW Hydropower Naltar-V was also approved. The Executive Committee of the National Economic Council (ECNEC) also agreed to work on the project of 150 MW Sharmai Hydropower project in Upper Dir, the other projects of 132 MW Shogo-Sen project and 144 MW Shushgai-Zhendoli Project in Chitral was also approved. For increasing the capacity of Mangla Power station from 1000 MW to 1310 MW, ECNEC also gave its approval for the renovation and advancement of the limits of Mangla Power Station. It accepted to complete the Kachhi Canal Project Phase-1; it would be completed in December this year. Fifteen billion rupees would be given to the people of Balochistan by the Federal Government on the behalf of Prime Minister Nawaz Sharif. The construction of Shadi Kaur Storage Dam was also approved by ECNEC. The additional work suggested by Balochistan costing 6522.81 million rupees was also commended.